We all know we should save for retirement, right? But we don't. We're just not sure where to start...or when. Experts use complicated terminology and conjure up magic numbers. Do we really need to set aside a million dollars? And if we don't have a snowball's chance in hell of saving that much, should we even bother to try? Gail's answers are no and yes - no, there is no magic number that fits everyone, and yes, you must bother! The hardest part of retirement planning is getting started, so Gail walks you through the steps to put momentum on your side - even if it's with as little as a dollar a day. It's never too late to begin, but it's never too early, either - so let Gail show you how. No expert, Gail included, should offer a one-size-fits-all solution, which is why Never Too Late has concrete steps for developing a plan that is right for YOU. Never Too Late is about cutting through the crap, taking charge, and taking action to create the future you want. 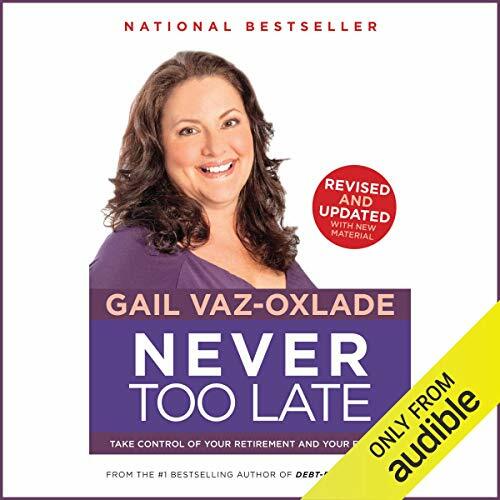 ©2011 Gail Vaz-Oxlade (P)2019 Audible, Inc.